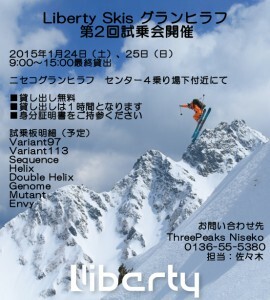 Due to massive popularity last week, a second “Liberty Skis” test-ride event has been swiftly confirmed to be held on January 24 (Saturday) and 25 (Sunday), 2015, near the base of the Center 4 Lift (in front of .Base)! We’ll be lending out gear from “Liberty Skis”, a freeride ski maker from the US, for free! Come and take advantage of this great opportunity! It looks like it’s going to snow at the weekend!